Prepared in 30 minutes or less plus 60 minutes to bake. Coat a large skillet with olive oil and heat over medium-high heat until hot. Add lean and beef and spicy sausage to skillet and brown meat until it is no longer pink, approximtaley 10-12 minutes. Break up any large lumps with wooden spoon while browning. Season meats generously with salt and ground pepper. Remove from heat and set aside to cool. Combine in a food processor the onion, carrots, celery stalks, garlic, basil, parsley and oregano. Puree this mixture then add to the hot skillet and stir to combine with the meats. Gently stir in the flour with a wooden spoon. Add the red wine and cook meat mixture until the liquids have reduced by half. Stir in the canned tomatoes. Add the heavy cream, nutmeg and hot red pepper flakes. Combine the fresh ricotta cheese with the Parmigiano-Reggiano cheese. Stir in the lightly beaten eggs. Season cheese mixture generously with pepper. Coat the bottom of a 13×9-inch baking dish using an olive oil soaked paper towel. Assemble the lasagna by arranging a layer of cooked noodles lengthwise slightly overlapping. Line each side of the baking dish with a lasagna noodle to form a collar to better hold in the filling. Spread half of the ricotta cheese mixture over the pasta all the way to the edges with a spatula. Next, spread half of the meat mixture over the cheese mixture. Sprinkle half of the shredded mozzarella atop the cheese mixture. Top with a ladle of meat sauce. Repeat. 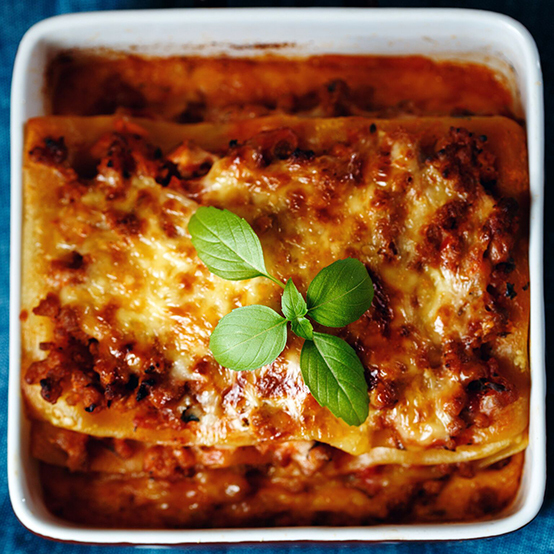 Top the last layer of lasagna with only noodles, meat sauce, shredded mozzarella and Parmigiano-Reggiano. Cover the pan with aluminum foil and bake for 45 minutes. Remove foil and continue baking for another 15 minutes until sauce is bubbling and top is browned. Allow to rest and settle on wire rack for 20 minutes before serving. Cut into squares garnish with chopped basil and serve hot. Serves 8-10.